Talal Derki: (Sarout had) No fear at all. Like the day Basset stood above the crowd and started taunting the regime's snipers who had him in their crosshairs. ...So they took out his brother, his cousins, his friends. Orwa Nyrabia: "They were all killed in his own-- in-- in his family's apartment. It was a very difficult moment." Orwa Nyrabia, the documentary's producer also filmed parts of it. We met him near the Syrian border in Turkey. Orwa Nyrabia: So his mother was forced to make tea to the soldiers while they were killing her son. And that was moment when he said, "Peace is not going to work." Basset was soon transformed from protester to armed revolutionary. His small band of fighters began taking neighborhoods controlled by the regime. Assad's soldiers struck back slaughtering thousands. There is a lot to be troubled about in regards to this report. 1. For example, we are presented with the claims of individuals who support a bloody 'revolution' against their government and army. However, we do not see the faces or hear the views of the general public in Syria, that is millions of people who don't support a militarised opposition. 4. On a visit back to Damascus in 2009, I met and interviewed Orwa Nyrabia. I had heard that his father had been a political prisoner, but I admired Orwa for being a documentary film maker and someone who brought foreign films to Syria. I believed he supported evolutionary change for Syria, not 'revolutionary' terror. I was wrong. Last year, I had a Twitter conversation with him and he made it clear he doesn't support peace for Syria now. That is something for the future, in his mind. But will Syria have to be destroyed for his future peace? And who benefits from its destruction? 7. In regards to Simav's contribution, she is a Kurdish (Syrian?) woman who supports the 'revolution', but we do not know what motivates her. I was at a press conference in Damascus in 2013 for a delegation of international peace activists. Yara Abbas, a young female reporter asked a question. A few weeks later Yara was killed by a sniper. Simav and Yara are two very different women. Who would we feel most empathy for: the young woman risking her life in support of armed men who are most likely motivated by an extremist ideology, or the young woman who reported on regular Syrian soldiers who went into battle against those armed men? 60 Minutes would be able to present a truer picture of Syria if it reported on Syrian women who are prepared to risk their lives every day simply to go to work, to the local market, or to university, and then back home. Tell us about the mortars fired from rebel-occupied areas into suburbs and towns. In 2013, one of my good friends was killed in Damascus by a rebel mortar as she made her way home. With the two main spellings (Saroot and Sarout) I get only seven death records, on the martyr's side. (Regime forces list doesn't let you search by name) First, fighters taking Abdulbasit's lead, in reverse chronological order. Abdullah al-Sarout non-civilian, from Bayada, Homs. FSA. Died of "shooting" Jan. 9, 2014 in "A massacre of more than sixty people from the Free Syrian Army while trying to break the siege on the city of Homs"
Ahmad al-Sarout from same, FSA brother/cousin, died same day and same way as the above, same "massacre." The entry has a photo of him on a (previous?) hospital visit with serious injuries. Mohammad Waleed Mamdouh al-Saroot, FSA, from Bayada as well. Died by shooting, 2013-07-08 "during the clashes with the regime's army forces." One photo looks exactly like Andulbasit, and the other looks a bit different. 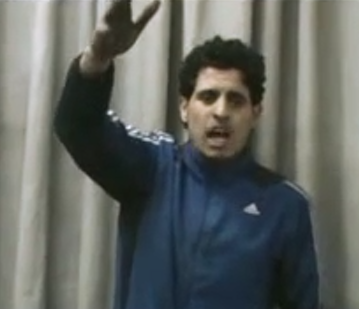 Hamad al-Sarout Non-civilian, from Jabla, Latakia. Displaced by the law and order and peace that prevails there, he was forced to be a militant elsewhere, and died in Raqqah, October 25, 2012. Unless... he's listed as "Defected Soldier" and on the "martyrs" list, but he didn't make it far enough to get the FSA stamp. In fact, he was "martyred by the regimes' army after trying to defect from the 17th Division in Raqqa." Sometimes this seems to mean he was killed by FSA in an attack there, killed by the regime that hired him, for failing to defect on time. He did try, though, and was Sunni, we can presume. He was claimed for the rebelling portion of Syria's Sarouts. Waleed Al saroot from Bayada, like the above, but he didn't take up fighting. Somehow, he died from "shooting" anyway, back on November 11, 2011. No details given. Did he turn down a family recruitment drive? Mohii Aldeen Al saroot Two days later, they wouldn't likely be scraping the bottom enough to shoot down this man of 60 for refusing to fight. This time, it must only have been to make the "regime" look bad. Not from Bayada, but Cairo street, nearer city center. " Uncle of Abdel Baset Saroot." Died of shooting November 13, 2011. This page was last edited on 7 January 2015, at 11:06.